The Sheedy sisters had lived in Stone House for as long as anyone could remember. Set high on the cliffs on the west coast of Ireland, overlooking the windswept Atlantic ocean, it was falling into disrepair - until one woman, with a past she needed to forget, breathed new life into the place. Now a hotel, with a big, warm kitchen and log fires, it provides a welcome few can resist. Winnie is generally able to make the best of things, until she finds herself on the holiday from hell. John arrived on an impulse after he missed a flight at Shannon. 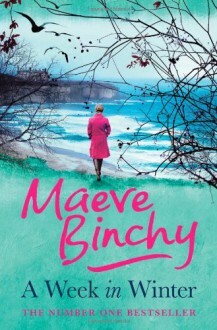 And then there's Henry and Nicola, burdened with a terrible secret, who are hoping the break at Stone House will help them find a way to face the future ...A WEEK IN WINTER is full of Maeve's trademark warmth, humour and characters you want to spend time with.